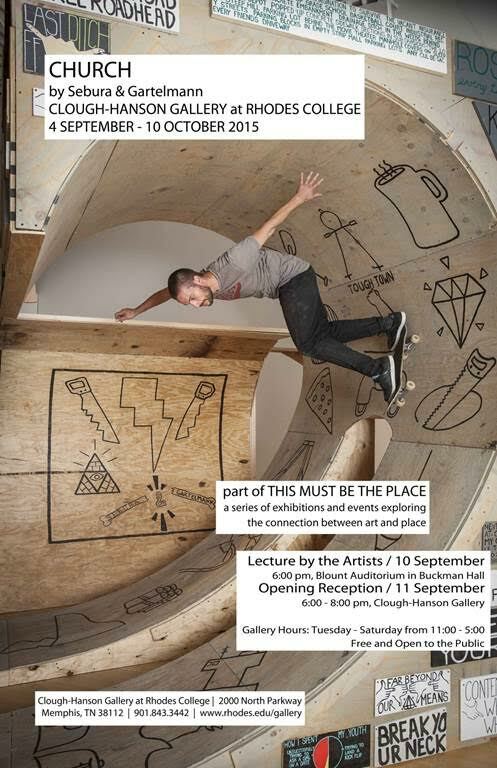 Clough-Hanson Gallery is pleased to present CHURCH by Sebura and Gartelmann This large-scale installation combines elements of skate parks with suburban, vernacular, and sacred architecture to produce a mediation on memory and place. The space it creates is sincere and absurd, private and public, contemplative and riotous. Jonas Sebura and Alex Gartelmann met while working toward their MFA at the School of the Art Institute of Chicago, and have been collaborating since 2009. They have exhibited work throughout the United States in venues including Carrie Secrist Gallery in Chicago, The Urban Institute of Contemporary art in Grand Rapids, the University of the Arts in Philadelphia, and the Edwin Gallery in Detroit, Michigan. Jonas Sebura received his MFA from the School of the Art Institute of Chicago and BFA Degree from Alfred University in 2003. He has been an Adjunct instructor in the Sculpture Department at School of the Art Institute of Chicago and attended residencies at the Charlotte Street Studio Residency in Kansas City, and The Ox-Bow School of Art in Saugatuck, MI. Alex Gartelmann received his MFA from the School of the Art Institute of Chicago and BFA Degree from the University of the Arts, Philadelphia. He is faculty in the departments of Contemporary Practices and Sculpture at the School of the Art Institute of Chicago. This exhibition is part of This Must Be the Place, a year-long exploration of art's relationship to place, presented by Clough-Hanson Gallery and curated in collaboration with Karen Patterson, Associate Curator of Collections and Exhibitions at the John Michael Kohler Arts Center. It will culminate in a conference in February 2016 at Rhodes College. Also part of this program and on view until September 30, the Terrain Biennial is installed in sites throughout Memphis.